Epic Games’ and People Can Fly’s 2011 shooter, Bulletstorm, will likely never see a sequel. Twenty years from now when I’m an old man babbling about how videogames used to be when I was young (and things were better, goddammit) the young kids will probably never know that there was ever something called Bulletstorm. They will think me a sad, over the hill geriatric who lives in a world of confused nostalgia where a massive publisher like Electronic Arts would take a chance on a strange, colourful and crude little shooter that was so atypical of the videogame landscape at the time. It did happen, though. 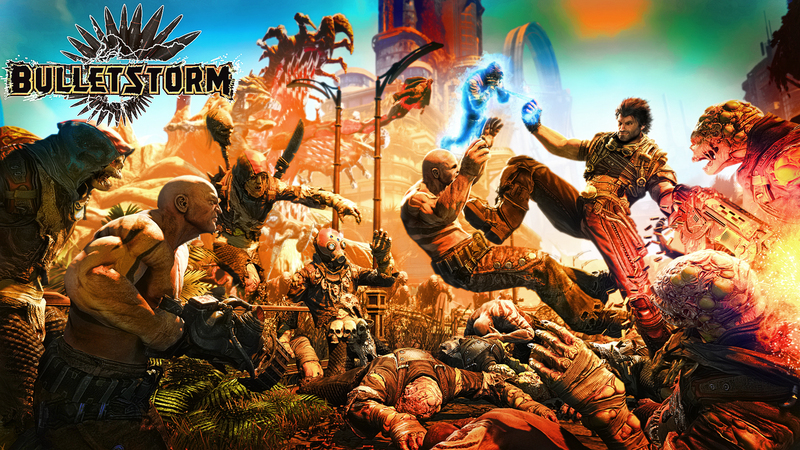 Bulletstorm was created, marketed, released and, in its own modest way, purchased. And in its reality there are many lessons we must take away from its lack of success — from its inability to change the way that first-person shooting games were made and bought in and around the early 2010s. Read on, savvy industry folks and ensure that you never make the same dreadful mistakes that sank the foul-mouthed shooter that could. Have you ever been walking through a forest during a crisp mid-winter’s day, taking in the green of the pines, the brown of the tree trunks and the overwhelming, uniform whiteness of the snow when, to your disgust, an impossibly red Cardinal or stunningly bright Blue Jay twitters across your view? I can think of nothing more abhorrent than this disruption of an otherwise bland environment. Bulletstorm encapsulates this problem. Everything is varied in its environments, its array of weapons and its enemy designs. It’s just awful! During one stage the player must navigate the outside of a sprawling dam — in others the battleground shifts to a futuristic theme park, tropical rainforest with a sprawling panorama of sci-fi beaches or the outside of a neon-lit, glass-paneled high rise office building. All of it is colourful, suffused with an attention to detail that, in its refusal of drab uniformity, makes the levels feel truly alive. The same commitment toward variety applies to the weapon loadout, a group of tools that are drip fed throughout the length of Bulletstorm‘s brief, expertly paced campaign. Instead of the usual line-up of hyper-realistic, arms industry licensed weaponry, Epic/People Can Fly created a bizarre series of guns that shoot cannonballs, allow for full control over the course that a long-range bullet takes, fire delayed explosive rounds and launch propulsive drill bits. The gall of this design decision is that not only does the shooting experience remain varied and exciting throughout the entire game, but it doesn’t even let players help contribute money to the manufacturers of their favourite real-life murder tools! The people behind the most successful role-playing games know that anything that exists in a fictional world must be itemized and described in painstaking detail if the player is to invest in the narrative. There is simply no point in having a backstory if it is not Tolkeinized to the nth degree. When exploring a science fiction universe the environment should not relay information on its own and, god forbid, characters must not simply contextualize past events during in-game conversations. Videogame players do not have the intellectual muscle necessary for filling in the blanks. They must have all relevant details laid out before them in sprawling menus of text, books that can be picked up and read during pause-interrupted action sequences or, better yet, accompanying novels and animated features released before and after the videogame itself. The beauty of modern first-person shooters is that the vast majority of them are simple. One button zooms in a gun, the other shoots it. Shoulder buttons handle throwing grenades. Bulletstorm spits in the face of this design by introducing a dedicated buttons to kicking, sliding and “leashing.” All of these actions, when performed upon enemies, moves them into a slow motion fall that allows them to be manipulated in various (always deadly) ways. Slide across the battlefield and knock into a slavering mutant and they freefall toward a cactus, explosive barrel or carnivorous plant. Leash them from behind the cover they’re hidden behind and then, once exposed, kick them off a ledge as they come closer. The higher the finesse shown in taking down an enemy, the larger the number of points awarded to the player for use in buying ammunition. It’s all too complicated isn’t it? Why not just make the game about shooting bullets? If it’s good enough for Call of Duty it should be good enough for every action game. When I play a videogame from exceptional franchises like Medal of Honor or Call of Juarez I can immediately tell when I’ve defeated an enemy because they fall over or, if the encounter is particularly well designed, they will get stuck in the level geometry doing a kind of quicksand breakdance. This is not the case in Bulletstorm. This game, for unknown reasons, believes that the shooter can be about more than knocking down glorified rifle range targets. Videogame players, as established above, cannot be trusted to use more than a few simple mechanics properly. Giving them more than they expect can only result in failure or frustration. 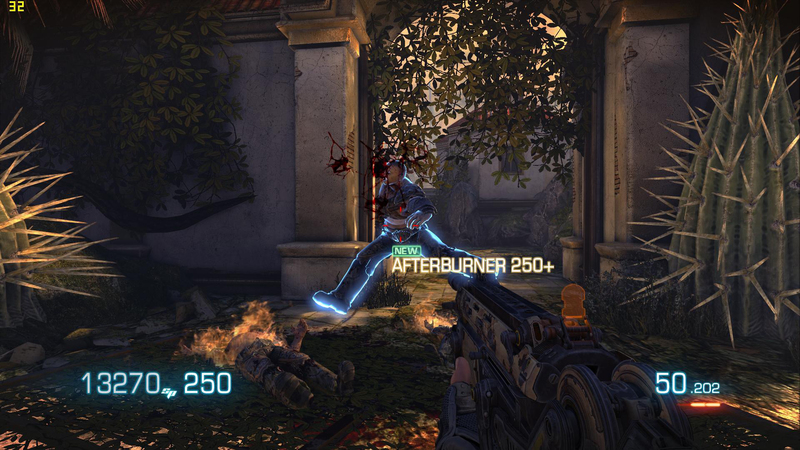 Once players had finished Bulletstorm‘s campaign they could either play its fairly shallow multiplayer mode, work through a score attack component or just replay the campaign. This makes the game — $60 American dollars at release — an enormous waste of money. 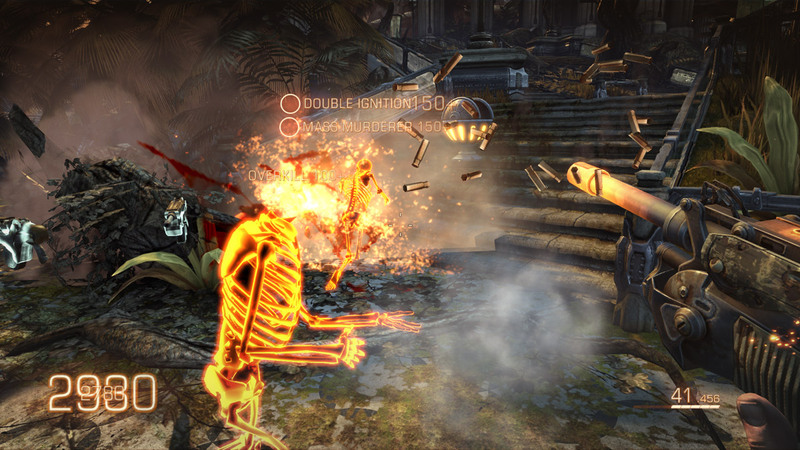 Nowhere is the player tempted by leveling systems, gear unlocks or the ability to customize the banner that pops up on an opponent’s kill-cam. Epic and People Can Fly seem to assume that because a videogame’s core mechanics are enjoyable to play with through a campaign they will continue to be fun to explore outside of dopamine-drip multiplayer “progression” systems. Naturally, anyone who enjoys playing through a fast-paced campaign will never wish to revisit that experience. If they liked mastering the wide array of weapons and “Skill Shot” shooting tricks during a first run of the story mode they will not wish to explore these systems further in an arcade-style score tracking game component. That’s just crazy. Listen, the best comedies don’t have characters; they have caricatures. Bulletstorm, despite first impressions, attempts to flesh out its small cast by giving them relatable goals, motivations and personalities. It is a mistake to take jokes centred around main character Grayson Hunt’s near alcoholism during the games opening and then go on to examine just why it is that the man has a drinking problem as the story progresses. The player wants to laugh at cardboard cut-outs, not be confused as to why there may be something more going on behind a given gag. Even worse, Grayson’s seemingly homophobic ribbing of his cyborg squadmate, Ishi, are immediately contextualized as a satirical goof on military-style hypermasculinity within seconds. Can’t a game just have a laugh without asking its more close-minded players to question entrenched sociological prejudices? God, Bulletstorm. It’s almost as if the game’s writers were trying to make a subtle comment on the piles of military fetish shooters it knew it would be compared to. No one likes comedy that makes you have to think about why you’re laughing, Bulletstorm. Bad show. At least we can take heart in knowing that a game that did so many things wrong has been given the legacy it deserves. No one has to worry about the ugly mistakes of Bulletstorm cropping up in other titles because the game that made its mistakes has been left as a rotting head on a stake outside of its developer’s and publisher’s gates as a warning to others daring to follow in its path. “Take no chances”, it cautions. Reid McCarter is a writer, editor and musician living and working in Toronto. He has written for sites and magazines including Kill Screen, The Escapist and C&G Magazine. He maintains literature and music blog, Sasquatch Radio, and, more importantly, founded, writes and is editor-in-extremis for game site Digital Love Child. His Tweet-fu is strong @reidmccarter.